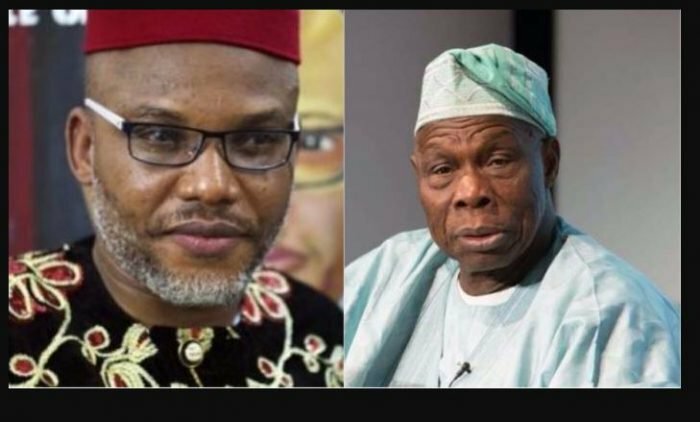 Leader of the Indigenous People of Biafra (IPOB), Nnamdi Kanu has threatened to wipe out former President Olusegun Obasanjo and his household should he (Kanu) be killed. Addressing elders and chieftains at his residence in Ibeku, Umuahia, Abia State on Thursday, Kanu said his organization would kill Obasanjo if he attempts to harm him. Kanu’s threat came after former President Obasanjo commented that Nigerians must do everything possible to stop the campaigning for the secession of Biafra, a cause spearheaded by Kanu. The former president made the comment on Tuesday while speaking at the International Conference Centre in Abuja during the launch of the biography of the late Brigadier Zakariya Maimalari. He stressed that a failure to put an end to the Biafra agitation could lead to a repeat of the 1966 coup and the other events that eventually culminated in the civil war. The Biafran agitator responded with a threat to the elder statesman. “I remember Obasanjo calling us names. They said we must eliminate Kanu and for those words coming out from his mouth, he is going to die,” Kanu declared. “I told Obasanjo that I have given instructions to IPOB should anything happen to me. Everything that comes from Obasanjo’s lineage will die the same day at the same time. It is a standing instruction to IPOB. “Wherever they are, we will kill them ourselves at the same time, the same day, 12 noon, wherever we find them all over the world. I am not like anything they have seen before,” Kanu boasted.